October 31, 2007 by Karl Fogel 5 comments on "Weirdest spearphishing attack ever?" I received the oddest spearphishing attack the other day. At least, I’m pretty sure that’s what it was, though can’t be 100% positive. Here’s the correspondence, with the name changed slightly to protect the innocent (if she is innocent, which I highly doubt). I would like your help in a very serious matter. place is in jeopardy right now. Now, I didn’t read that original mail when it first arrived. When email from an unknown sender has the subject line “urgent!”, I don’t even consciously process it as spam anymore — a couple of neurons somewhere in my brainstem take care of hitting the Delete key, while I go on to read the next subject line in my inbox. Whoa. Only a human could have sent that, because it had the “KNOTSPAM” marker signifying that the sender has read my web page explaining how to send me email that won’t be mistaken for spam. So she was real, and she was trying to talk to me in particular. Do we know each other? What makes you think I can help with this? and I have no record of ever having exchanged email with you before. to make me look very bad at my boss's eyes. through a free account email from a foreigner provider. can help me I would very much appreciate it. I can't help with your problem. outsider's point of view, neither one is more likely than the other! no point for me to try convince you otherwise. shows how really desperate I am to find out the truth. thank u deeply for even replying to my mail. I have no idea what to think now (other than I love the Internet!, of course). Searching for her real name gets exactly one hit, on a web page at the same ostensible Greek travel agency as her email address. On the off chance that she’s telling the truth, I’ve changed her name, and that of the travel agency. But not her number: if you want to get in touch with her, go for it, and good luck! October 29, 2007 by Karl Fogel 5 comments on "Banjovial." I like this photograph because the light and image somehow seem to capture the sound of the bluegrass jam at the Atlas Cafe in San Francisco last Thursday. 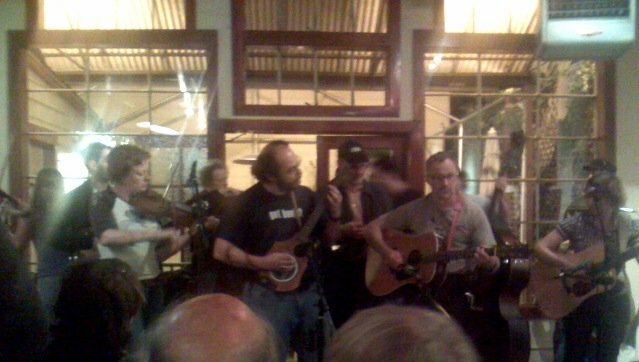 The photograph was taken by Wilfredo SÃ¡nchez Vega, and the fellow at the center — the one most in focus, the one for whom the light rays seem to part, the one with, yes, the banjo — is none other than Ben Collins-Sussman, Subversion developer extraordinaire and well-known speaker on topics open-source. He also played a darned good solo that night!